We arrived into Hanoi around 10.30am and after clearing customs, were ushered straight into our pre-arranged hotel chariot. Experience dictates that it’s worth paying a little extra to have someone greet us. It is a lot less stressful than trying to negotiate with a taxi driver on price or wait in long taxi queues to then be taken for a joy ride before you eventually get to the hotel. We enjoy the arrival experience much better this way and it’s usually only around $50-$100. It’s worth it. We also spend more on luxury hotels and upgrading our rooms than we do on forking out thousands on business class flights. Upgrade using points for sure but we have been able to see a lot more of the world using this philosophy. We arrived at Hotel de l’Opera Hanoi, a lovely boutique hotel by Sofitel. The hotel is well located in the centre of Hanoi, close to the Opera House (who knew!) It’s a short walk to Hoan Kiem Lake and the Old Quarter. We always stay close to the centre of town or near “old town” which makes the wandering around more convenient and interesting and there is a lot of beautiful architecture to see. It’s now 6pm on a Friday and guess what? It’s Happy Hour! We’ve wandered out of the hotel and after a mere 2.5 minute stroll, we’re taken by the red rooftop umbrellas of the impressive old colonial building called Press Club. The Press Club is situated in an historic home of former writers and journalists. It houses La Table du Chef, a 2 michelin-starred restaurant by Parisian Chef, Alain Dutournier. Amazingly, we bypassed the restaurant and went straight to the rooftop bar called La Plume Bar & Lounge. It’s Happy Hour after all! The cocktail and wine list is extensive and has a lot of beautiful French wines by the glass. Our waiter, Dine (pronounced Din) is fabulous and has been at La Plume for 8 years, a rare thing for someone to stay so long at one place especially in the food and beverage industry. Our drinks arrived just the way I LOVE wines-by-the-glass to be presented – on a tray with each bottle and separate Riedel (pronounced Ree-dle rhymes with needle) glasses for the two varieties. Also something very rare with wines by the glass service. We also got to taste the wines first, to check for cork taint or oxidation and for our approval, prior the glasses being poured fully. Bar one in Hanoi and already they’ve met my wine standards of service. This is excellent. We stayed for another glass of wine whilst enjoying the roof, the view and talking to Dine. The great thing about staying in the French Quarter of Hanoi is there are so many fantastic places to visit all within a very short distance from each other. Our next stop was a bit nostalgic. In 2007, we stayed at the Sofitel Legend Metropole Hotel and decided that we simply had to drop in to see it again. We found ourselves in lovely leather bar-stools at the Bamboo Bar under its thatched roof. It’s great sitting at the bar to watch the cocktails being concocted in front of you. By this stage of our evening the weather was a bit cool (it’s winter in Hanoi in December by the way) but definitely worth the experience. The great thing I love about Vietnam (potentially for all the wrong reasons) is that though the French had occupied Vietnam for almost 100 years, the influences of their food, wine and architecture is now a part of Vietnam’s fabric. Together with the beautiful Vietnamese food and produce, it is foodie heaven and a wine lovers paradise all rolled into one which makes Vietnam an amazing country to visit. It wouldn’t have been right for us not to have foie gras (I know a lot of people disagree with how foie gras is obtained, but I admit, I love it.) And it was awesome! That’s all I say about that! The best thing though was when Patrick’s wine arrived, he was presented with a Riedel Cabernet glass and the wine (Bordeaux blend of Merlot and Cabernet Sauvignon from Chateau Le Grand Verdus) was poured from a Magnum. A.mazing! After our drinks we wandered into Le Club Bar of the Hotel which is one of Hanoi’s classiest jazz bars. It was here we met Michelle Walker. An internationally renowned Jazz singer, songwriter based out of New York. Michelle is in Hanoi for a 3 month residential at the Sofitel Legend Metropole Hotel. After one of her sets, she was sitting on her own at the bar, so of course, we went and said hello. She is just lovely and seemed so touched we went to speak to her. We’re now following each other on Instagram! We loved it so much we popped in the next night to say hello and hear a few sets as well. She’s fabulous and yes I bought her CD (it’s cool you can still do that!) I can’t help myself – ask Patrick! To round out our night, we headed back to our hotel (another short walk away!) There is a beautiful atrium bar at the Hotel de l’Opera called La Fee Verte (it means the green fairy) which is the name of the Absinthe based signature cocktail! Of course I had one! Potentially dangerous but delicious! Buffet breakfast at hotels is not something we partake very often. It just seems to be an “insert-here” type of experience. The same western food with touches of the same Asian dishes. It’s often purposed-served and boring and not a true representation of the city you’re visiting. We prefer to go out of the hotel and find a great local coffee shop or bakery or somewhere locals eat. Having said that though, the breakfast offerings at hotels in Vietnam are different. They do have all that same-same stuff I mentioned, but they take particular pride in offering their own local dishes like fantastic pho or noodles made for you on the spot which is much tastier and the Vietnamese coffee is excellent as well. Today was going to be a big day so we did indulge in a bowl of traditional beef pho before heading to our private cooking class which was to be conducted back at the Hotel Metropole. A great friend of mine had highly recommended this cooking class but we weren’t able to do it last time due to kitchen renovations the hotel was doing at the time. We were so excited to be doing it this visit – 10 years later!! We were greeted with warm, professional hospitality at the Sofitel Metropole Hotel. It’s a beautiful French colonial hotel opened in 1901. We were welcomed by Madam Lien, who has been one of the Chefs at the hotel’s Spices Garden Restaurant for almost 8 years (another F&B stayer!) Madam Lien then ushered us straight out of the hotel and into a waiting taxi to take us to the local wet market, Cho Hom Market. Madam Lien guided us through the herbs and spices section, seafood and meat section complete with caged turtles (yep you read that right) and the fruit & veg section. It was fabulous. I love a market. The market has a second storey which is home to some of the best selection of fabric in Hanoi. Today though, we were only focused on the wet market ground floor! Taxi back to the hotel and ushered into a private room. We spent the next couple of hours with Lien while she expertly taught us how to slice, boil, mince, fry, chop, crush, trim and marinate our way through six dishes. We were given a beautifully presented folder with all the recipes as well as a sheet with the names and matching images of all the herbs used. And a show bag each with some cooking utensils, branded apon and ingredients to make rice paper rolls. The whole experience included lunch in the restaurant where Lien was one of the Chefs – Spices Garden Restaurant. Full as googs after tasting all of the dishes during our class we didn’t have too much more for lunch but we ended it well with glasses of an Austrian grape variety I love called Gruner Veltliner and a Napa Cabernet Sauvignon. Note to self….didn’t need the bowl of pho for breakfast!! Walked up to Old Quarter and found a few art stores. We bought two pieces from a lovely family. While the Dad packed up the art for us, Mum and her 2 boys were “practising their English” with us. The little kid – Bill proudly sprouts to us that he’s 10 years old. He told us he was named after Bill Gates – “He’s a very rich man and so will I be one day” says Bill. I have no doubt! Little Bill tells us he likes the name Robert and would prefer to have that name instead! “It’s a handsome name” he says. I told him my Grandfather, and my Brother are both called Robert. He thought that was cool. We’re about to wrap up and he announces that he’s looking forward to getting tall! Patrick took a photo of Bill and myself together. I was keen to help him get taller, so I knelt down for the photo and “voila” – he was taller than me. He was happy! She laughed when she heard Bill say that. She thinks he’s got no hope because she and Bill’s Dad are not tall!! We left again about 6.30pm.He was such a character and now those pieces of artwork will always remind us of that brief time we spent with Bill and his family. We waved good bye and headed back to the hotel for a well earned nap – it’s been a busy day! Patrick found out about a wine bar called Wines Corner which was in fact, just around the corner, in the French Quarter. It was a great concept but the wines offered by the glass were a bit lacking. Left there and went to El Gaucho Argentinian Steakhouse for a drink and “snack”. After such a huge eating day we did not need much! We shared a bottle of Tuscan wine from a famous winery I love, Ornellaia. It matched very well with empanadas and grilled porterhouse carpaccio with lemon. To round out day 2, we’d been told about a famous Hanoi jazz haunt called Binh Minh Jazz Club, named after its owner, Mr Quyen Van Minh. Minh teaches saxophone at the Hanoi Conservatory and wanted to moonlight so created his own club. The music was fantastic. Had a great pianist, alto sax, double bass and drums. Bit of an eclectic crowd which we loved. It was a fantastic day of full of markets, cooking, 5 star hotels, art and jazz! What’s not to love about Hanoi! A trip to Hanoi wouldn’t be complete unless you find yourself on the back of a Vespa. Getting around Hanoi by motorbike means relentless traffic and non-existent road etiquette. But there seems to be no ego in their driving whatsoever. For sure, the traffic is ridiculous but people just seem to happily dodge and weave their way around. Vietnam’s capital has a population of around 7.5 million with a whopping 5 million motorbikes chug-a-lugging their way around the city. Many of them carrying entire families or boxes stacked 10-foot-high or 17,000 crates of eggs (ok my random exaggerated number!) or even air-conditioning units! It’s crazy. A friend from Singapore recommended a fun tour company called, Hanoi Vespa Tours. I did the half day tour which I happily agreed to do in the afternoon!! Because everyone who knows me knows I don’t do mornings!! I was collected by a guy named, Anh at 12pm and taken to the Old Quarter to meet my guide, Sim, for lunch. She was just lovely. She told me I would always remember her name because she shares it with a phone chip! I was to be Anh’s pillion passenger and Sim would ride her pink scooter behind us. Sim proclaimed “It’s the cutest scooter in Vietnam!” It was hard not to agree! There was a fantastic little hole in the wall restaurant which was packed full of people on their lunch break. We shuffled in, shared a table and slurped our way through a delicious and famous Hanoi dish called Bun cha (grilled pork and vermicelli). Complemented by another famous Hanoi dish, fried spring rolls (called Nem Sai Gon). We had made these in our cooking class at the Sofitel Metropole Hotel so I was absolutely all in! 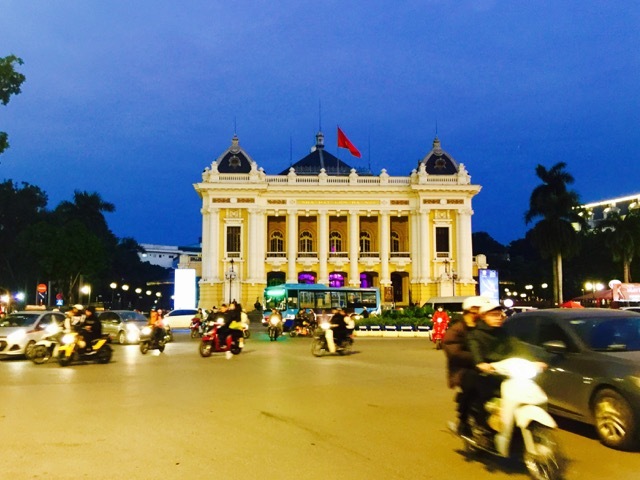 Our first Vespa stop was to see the French-inspired Colonial architecture of the Hanoi Opera House. It is stunning! Throughout the rest of the afternoon we visited the Long Bien Bridge, designed by Gustav Eiffel. Then to Hanoi’s largest freshwater lake, West Lake. It’s 17km in circumference and is picturesque as we drove around a lot of it, visiting some of the famous historic sites including Tay Ho Temple and Van Nien Pagoda. Then to the tiny Huu Tiep Lake in the Ba Dinh district to see a B-52 Bomber wreckage still highly visible in the location it was shot down. It’s a sobering reminder of the “American war”. Then to Ho Chi Minh’s Mausoleum and a 1000 year old citadel. By the way, Vietnam celebrated its millennium in 2010. Sim was full of fascinating information about the sights and sounds and history of Hanoi. It was a fantastic and exhilarating way to see Hanoi. Through all the manic traffic, on a beautiful sunny day with the wind in my face and bugs in my teeth!! I couldn’t wipe the smile off my face. I took way too many photos all while doing “Look Mum no hands” on the back of the Vespa. I want to go back to do the night time street-food tour now!Coffee is a national pastime in Vietnam and as a coffee lover myself, I asked Sim if I could try “ca phe trung” or egg coffee. It is a Hanoian specialty that has a creamy soft, egg-white foam. The cup is heated in a dish of hot water to maintain the temperature. You then fold the thick Vietnamese coffee through the egg-white foam and enjoy! It’s so delicious. The strength and density of the coffee together with the fluffy almost custard like foam is close to a dessert. I loved it. It was just the tonic to finish off my tour. Anh and Sim dropped me off at the hotel, hugs all round before we waved each other goodbye. After a quick couple of laps around the lake, followed by a quick dip in the spa to sooth the aching muscles, we ventured out for our last night in Hanoi. Cocktails first at a place called Tadioto Cafe & Bar. Touted as one of the best bars in Hanoi, we had to see for ourselves. Located in the French Quarter near the Opera House, it was a fabulous looking bar owned by journalist and raconteur, Nguyen Qui Duc who also has a talent for making furniture and his bar is a showroom for some of his amazing pieces. Over-achiever for sure! We had a cocktail each and a cheese & charcuterie plate which were lovely. We didn’t stay too long though, because there was a table of bloody loud young Americans. We left immediately after one of the girls started going on about watching the Kardashians! Pity though because we could have spent a lot more time there! Dinner beckoned, so we decided to treat our carnivore selves and returned to El Gaucho Argentinian Steakhouse. The Manager, Stanley, is a hoot and such a seasoned hospitality professional. He is an Austrian expat who has been in Hanoi for 6 years. We had one of our favourite Argentinian wines varieties from one of our favourite wineries to pair with our beautifully cooked steaks, a Malbec from Terrazas de Los Andes from Mendoza. It’s always fantastic wherever we drink it and this was no exception. So after a full on, jammed packed couple of days, we both looked at one another and said “Are you tired?” We both answered with a simple nod! But before we headed back to the hotel, Stanley wouldn’t let us leave without offering us a complimentary caramel vodka shot or two!!! This was our first trip to Hanoi in 10 years. We loved it in 2007 and love it even more in 2017. With its storied past, historical sites, beef pho, foie gras, French wines, egg coffee, Hanoi style spring rolls, beautiful colonial French architecture and amazingly friendly people all on 5 million scooters! Next postTICKING OFF THE FOODIE HEAVEN LIST!